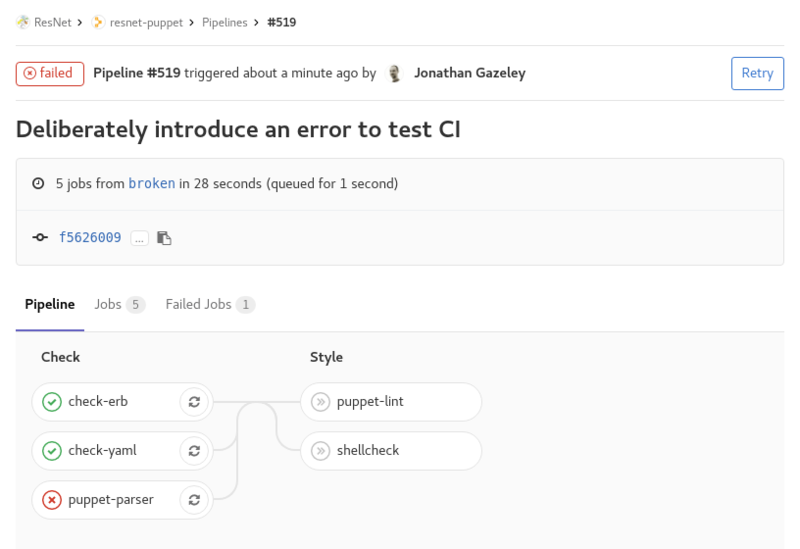 Like most people, we’re using git right at the centre of our puppet config management workflow. As I’ve mentioned previously, it features prominently in my top 10 most frequently used commands. Our workflow is based around feature branches, and quite often we end up in a situation where we have a lot of local branches which have already been merged in the copy held upstream on github/gitlab/etc. Today, I looked and noticed that while we only had 4 active branches on the gitlab server I had 41 branches locally, most of which related to features fixed a long time ago. This doesn’t cause much of a problem although it can get confusing (especially if you’re likely to re-use a branch name in the future) – 41 branches is enough that deleting them one at a time by hand is tedious. It looks like some gui tools/IDEs will take care of this for you, but I’m a command line kinda guy, and the git command line tools don’t seem to quite have this functionality baked in. After a bit of poking about, I came up with the following approach which deletes any branch which no longer exists upstream. # Delete all stale remote-tracking branches in origin. The above seemed to do the right thing for the two repos I tested it on, but well… you might want to try it on something unimportant before you trust it! NB if a branch has only ever existed locally (and never appeared under origin), it should leave it alone. But I’ve not tested that bit either. GitHub is an excellent tool for code-sharing, but it has the major disadvantage of being fully public. You probably don’t want to put your confidential stuff and shared secrets in there! You can pay for private repositories, but the issue still stands that we shouldn’t be putting confidential UoB things in a non-approved cloud provider. In the end, the easiest-to-deploy option seemed to be to use the GitLab Omnibus installer. 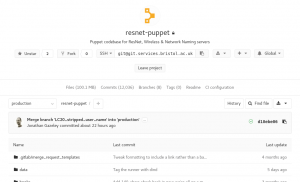 This bundles the GitLab application with all its dependencies in a single RPM for ease of deployment. 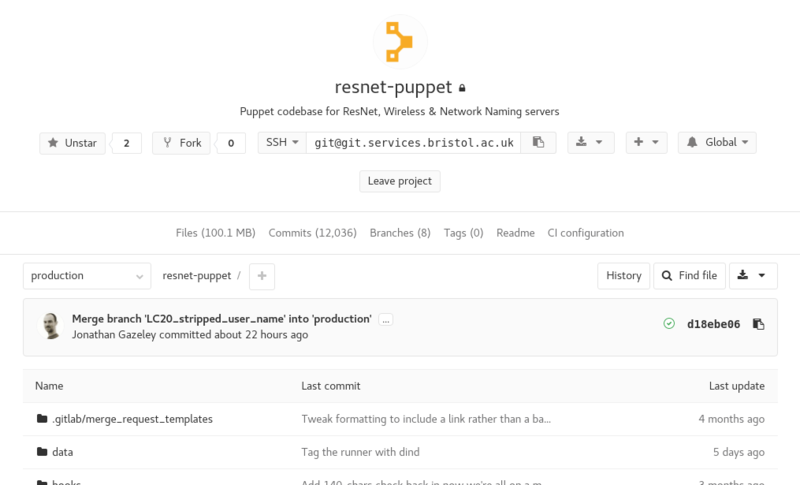 There’s also a Puppet Forge module called spuder/gitlab which makes it nice and easy to install on a Puppet-managed node. I also added a couple of resources to install the certificates and create a firewall exception, to make a complete working deployment. The upgrade path requires manual intervention, but is mostly automatic. 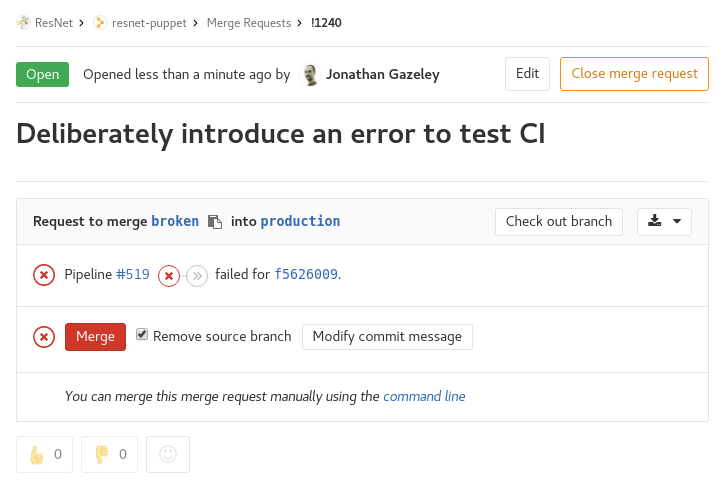 You just need to change gitlab_download_link to point to a newer RPM and change gitlab_branch to match. 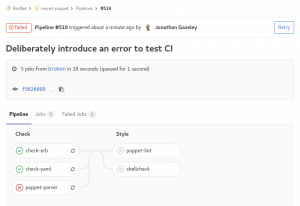 If anyone is interested, I’d be happy to write something about the experience of using GitLab after a while, when I’ve found out some of the quirks. Gitlab have changed their install process to require use of their repo, so this module doesn’t like it very much. 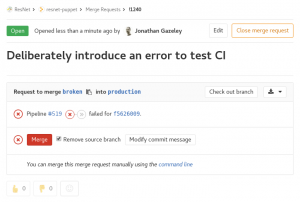 They’ve also changed the package name to ‘gitlab-ce’ rather than just ‘gitlab’. This seems to have allowed it to work fine!